Each year, the EAEA celebrates innovation and excellence in adult education. The EAEA Grundtvig Award highlights project results that produce new ideas, new partnerships, new methodologies and a new understanding how we can work in adult learning. 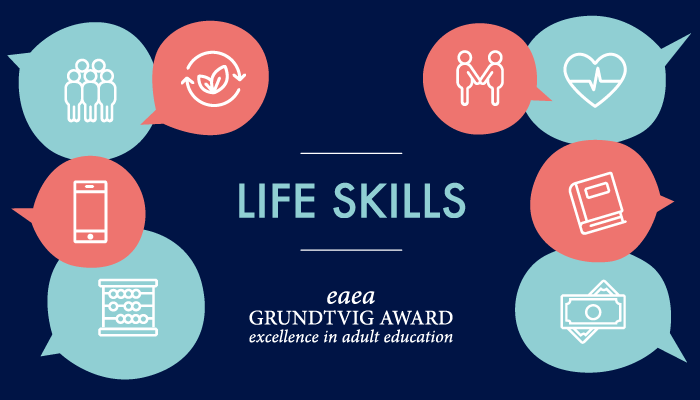 The theme for 2019 EAEA Grundtvig Award is Life skills. The call is now open. The winners will be announced at the award ceremony in EAEA General Assembly in Copenhagen. What is the EAEA Grundtvig Award? It inspires the practitioners, course providers, and project participants value their work, and to link more closely with one another. Any product of the project that is accessible to the public, presented in a comprehensible way, and may be useful and/or transferable to other adult education organisations is eligible to enter the competition. The EAEA Grundtvig Award is named after Nikolai Frederik Severin Grundtvig (1783–1872), a Danish educator centrally influential in the development of non-formal adult education in Europe and worldwide. He provided the adult education sector a foundational philosophy that underpins much of the work in lifelong learning. Grundtvig emphasised the intrinsic value of learning, as a foundation to living meaningful and enjoyable lives. This idea is central to the adult education that EAEA is promoting, with its focus on basic skills, valuing learning and active citizenship. Grundtvig laid the ground work for the development of learning centres, in all kinds of contexts, from residential educational institutions to agricultural co-operatives. He linked intellectual and cultural growth with group development, a prelude to civic relationships. Browse the EAEA Grundtvig Award publications!